Cybersecurity is a rather vague overarching term that is used in different contexts to mean anything from: “information and computer security”; security of the Internet infrastructure; security of anything connected to the Internet (including “essential services” such as electricity distribution); security of data; applications and communications; safety of Internet users (particularly children), and frequently encompasses notions of “national” security as well as “private” security. Indeed, there is no consensus on what the term means. 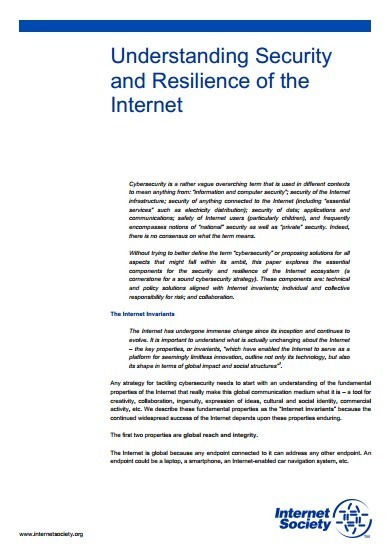 Without trying to better define the term “cybersecurity” or proposing solutions for all aspects that might fall within its ambit, this paper explores the essential components for the security and resilience of the Internet ecosystem (a cornerstone for a sound cybersecurity strategy). These components are: technical and policy solutions aligned with Internet invariants; individual and collective responsibility for risk; and collaboration.